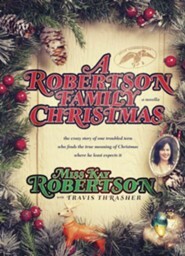 A nationwide contest gives a needy child the opportunity to spend Christmas with the Robertsons. A junior high kid from a poor family wins, and all things look wonderful, except for the fact that the boy is a complete terror. But he'll have to learn the hard way after the Robertsons get through with him. A heartwarming, hilarious story on the meaning of Christmas and what it's like to spend it with the Duck Dynasty gang. Hunter Clarke wanted one thing for Christmas: to spend it with his dad and his brother. He misses being included in any guy trips since his parents divorced and he went to live with his mom. So hes less than happy when his mother tells him that he won a contest to spend Christmas in West Monroe, Louisiana, with a family named the Robertsons. For some reason, theyre supposed to be a big deal. How did he win a contest he didnt enter? Besides, hes never heard of them and sure doesnt want to spend Christmas in a swamp with a bunch of strangers. Korie Robertson is excited to open her heart and home to Hunter and show him what the Christmas season looks like for the Robertson family. And like it or not, Hunter experiences it firsthand. From duck-hunting disasters with the bearded guys, to learning to cook with Miss Kay, Hunter quickly discovers what its like to live with this boisterous, yet loving family. Putting on his headphones and ignoring them is not an option. Before long, Hunter begins to let his guard down. But with Christmas and the end of his trip fast approaching, will it be too little, too late? Or will Hunter be open to the greatest gift of all? I'm the author/artist and I want to review A Robertson Family Christmas - eBook.